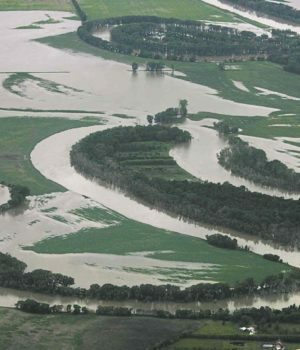 ruth bonneville / winnipeg free press files The Assiniboine River floods last July east of Portage la Prairie. The Canadian Prairies are no stranger to weather extremes and natural disasters. 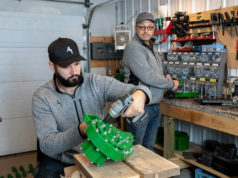 Floods and droughts here are among the costliest natural disasters in Canada, causing billions of dollars in damages to infrastructure and industries such as agriculture. These events are becoming more frequent and widespread as our atmosphere changes due to increased inputs of carbon dioxide and other greenhouse gases since the industrial revolution in the 1800s. Since the turn of the 21st century, the region has experienced some of the most devastating extreme events in its history, setting records in terms of damage, costs, severity/intensity, and spatial extent. Conditions have also oscillated between opposing extremes of flood and drought in a very short period of time and in close geographical proximity or at the same locations. 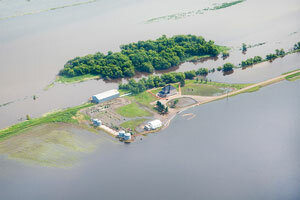 These recent extreme events have been unprecedented in over a century of observations – a record-breaking summer flood devastated the Assiniboine River Basin (ARB) in 2014 while a severe, widespread drought impacted large areas across Western Canada in 2015. 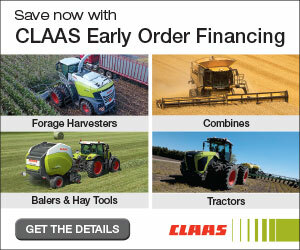 Both events cost billions in damages and highly impacted agricultural producers. Events such as these are occurring against a backdrop of rapidly changing environmental conditions, indicating that extreme flood and drought events will be more frequent and severe. Given the rapid environmental change the Canadian Prairies are experiencing, our historical understanding of water patterns and flows are no longer applicable to the future, let alone the current state of the region. Improving our understanding of the factors that contributed to the recent extreme flood and drought events can provide insight into the water futures for the Canadian Prairies. The following provides a brief overview of the 2014 ARB flood and 2015 drought and gives insight into what may be expected in the future on the Canadian Prairies. Figure 1 – Hundreds were forced to evacuate during the Assiniboine River flood in July 2014. The 2014 ARB flood was the by far the largest rainfall-driven flood on record and the magnitude and impacts came only second to the record-breaking 2011 spring snowmelt flood. On the Canadian Prairies, there has been a gradual increase in rainfall and decrease in snowfall due to a warming climate. There has been a transition towards more rainfall in the spring, with the May-June (MJ) period experiencing the most significant increase over the last five decades. Rainfall in MJ exerts the greatest impact on early summer streamflow and floods – and that is what happened in 2014. 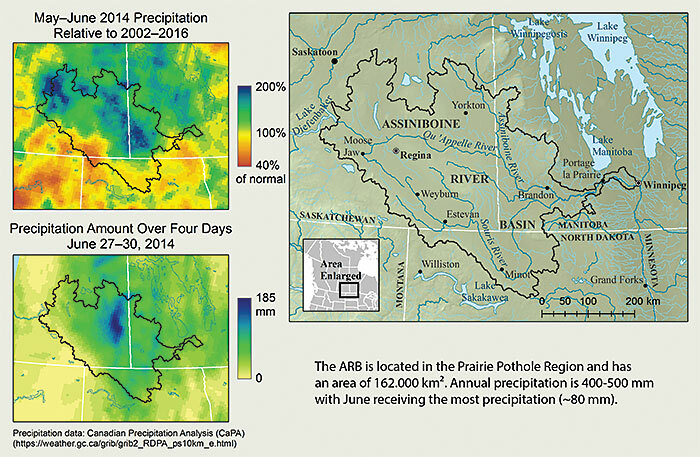 Figure 2 – Map showing the location of the Assiniboine River Basin and the anomalous precipitation that occurred in 2014 that set the stage for the summer flood. One of the wettest MJ periods on record occurred in the ARB in May and June 2014, with over 200 per cent of the normal precipitation in some areas (shown in Figure 2). Soils were saturated and surface depressional storage was nearly filled by late June due to a large snowmelt event in the spring and subsequent rainfall. Record-breaking rains fell over a large area of the ARB during the 4-day storm on 27-30 June with local areas receiving up to 185 mm which triggered widespread flooding across the region (shown in Figure 2). Damages from the flood are estimated to be $1.5 billion and left roadways and bridges severely damaged and hundreds of homes were forced to evacuate. Millions of acres of young crops drowned, accounting for $1 billion of the damages. The ARB flood of 2014 was unique in that it was driven by summer rainfall. Historically, flooding on the Canadian Prairies has been derived from snowmelt with some contributions from early spring rains. Peak runoff and streamflow have typically occurred in April, but streamflow records are showing a response to the increased MJ rainfall with more frequent above-average streamflows occurring after June 1st since the mid-1990’s. The increased streamflow response may also be amplified by the extensive slough drainage that has occurred in the ARB since settlement. Hydrological model results have shown that the magnitude of previous floods in the region (2005, 2011) were exacerbated by slough drainage and the same is likely for the 2014 flood. The hydrological regime has appeared to have changed in the ARB: rather than streams drying out by early June, substantial summer streamflows are now being driven by rainfall. There is evidence that such changes have led to greater nutrient export from agricultural landscapes to streams and lakes, contributing to algal blooms in places like Lake Winnipeg. Wetland restoration may be a viable mitigation and adaptation measure to minimize the impacts of climate change and wetland drainage in the region, such as the increase in rainfall induced runoff. Although the 2015 drought was short-lived, the impacts, severity and extent were unusual. Large areas across Western Canada were affected with the most severe impacts in British Columbia and Alberta (shown in Figure 3). 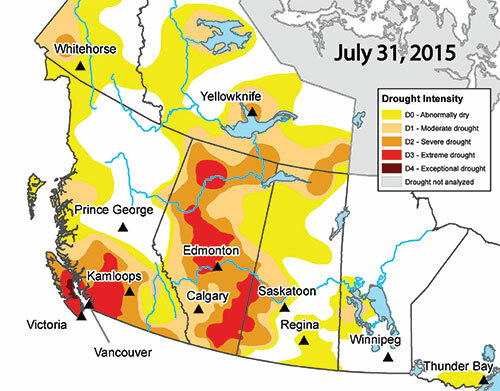 Many areas developed record or near-record dry soil moisture and streamflow conditions, prompting Alberta to declare a state of Agricultural Disaster by early August due to the significant loss in crop and pasture land. Restrictions on water use by irrigators and oil sands operators were implemented in Alberta and trout fishing was closed due to stress on the fish from warm water temperatures and low streamflows. The rapid onset of the 2015 drought was a result of climatic anomalies that occurred from winter to summer. Although precipitation during the winter was only moderately below normal, significantly higher temperatures of 2-6 ˚C during the winter and spring caused snowpacks to melt mid-winter and induced an earlier onset of spring snowmelt. Snowmelt runoff from the mountains was exceptionally low resulting in record low flows on the Bow River. 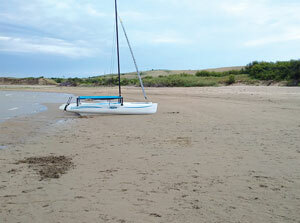 Consequently, the low water availability going into the growing season set the stage for the severe drought. Warm and dry conditions from May to July 2015 developed from an abnormal mass of warm water off the coast of North America which caused a high pressure system to stall over Western Canada for most of winter, spring and into summer. The high pressure system blocked out other weather systems that normally bring precipitation into the region and resulted in warm and dry conditions across much of the region. Stream and river flows were drastically reduced, reservoirs became depleted, records were set for glacial ice lost in a single year and crops quickly became parched. In August, some rains fell across the region, causing a recovery of streamflow, but it was too late for most crops to recover. The considerable areal extent and persistence of the 2015 drought and its likely association with unusually warm ocean temperatures off the coast of North American made for an exceptional event. It is likely climate change made this drought more severe and long-lasting than it should have been. The continued warming of temperatures on the Canadian Prairies, particularly in winter and spring, may have a substantial impact on water availability going into future growing seasons. Precipitation is projected to increase by 10-20 per cent by mid-21st century, but it will not be enough to offset the rising temperatures and severe drought risks are expected to continue. It is crucial that we advance scientific knowledge on the changing climate and how it will impact our water futures, including an increased ability to predict drought and flood events. As seen with the 2014 ARB flood and 2015 drought, anomalous climatic events are becoming more frequent. 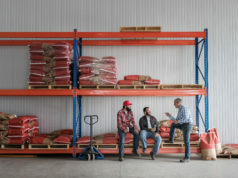 Understanding how extreme events may manifest in the future is key for developing forecasting capabilities and predictive tools to help agricultural industries make informed decisions to increase productivity. The development of a national flood, drought and soil moisture forecasting capability is just one of the goals of a new water research programme called Global Water Futures: Solutions to water threats in an era of global change (GWF). 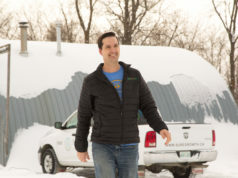 The $143 million, seven-year program led by the University of Saskatchewan in partnership with three other institutions (McMaster University, University of Waterloo, and Wilfrid Laurier University) will address the needs of end-users from across Canada, such as agricultural communities, to develop new tools and predictive capabilities to manage water-related risks. New sources of information and predictive tools will increase productivity by allowing farmers to make informed decisions from evidence-based tools developed through GWF, such as websites and smartphone apps. For more information on the 2014 flood and 2015 drought, please visit the Changing Cold Regions Network website at www.ccrnetwork.ca. To learn more about Global Water Futures, visit www.globalwaterfutures.ca. Stacey Dumanski is the outreach coordinator for the Changing Cold Regions Network (CCRN) and Global Water Futures (GWF), the largest university-led water research program to ever be funded. Previously, her research focused on the changes in hydrology in the Prairie Region.